Despite years of unqualified failure, nation's liberal intelligentsia announces full support as US redoubles its efforts in its catastrophic "war on terror"
One week before the Bulletin of Atomic Scientists moved the world's “Doomsday Clock” two minutes closer to midnight, Secretary of State Rex Tillerson announced in a speech to the neo-conservative Hoover Institute that the US will be indefinitely deploying thousands of troops to Syria in order to, “achieve a stable, unified, and independent Syria, free of terrorist threats and free of weapons of mass destruction .” The statement is a clear indication that the US intends to use military force against the regime of Bashar al-Assad. In using the word “independent”, Tillerson is indicating that the US will not tolerate a Syrian government heavily influenced as it is by Russia and Iran. By using the words “free of weapons of mass destruction”, Tillerson is referencing Syria's alleged chemical weapons stockpiles, giving further leeway for US military action against Assad. Given how vital Syria is as a strategic asset to Russia, Iran and Hezbollah, any use of military force against Assad would almost certainly involve military clashes between the US and one or perhaps all of its allies. To make matters worse, the use of Kurdish soldiers as ground troops has greatly angered Turkey, and any possible regime change in Syria could see the creation of a Kurdish state on Turkish borders, something Turkey is not willing to accept. When can we admit that the “war on terror” has been a horrible failure? It is truly impressive that the nation's intelligensia is capable of undertaking the mental gymnastics necessary to conclude that the rise of jihadi groups like ISIS is somehow an argument for further U.S. intervention in the region. Given how catastrophically the “war on terror” has failed to achieve its goals since 9/11, one would think that if the US were serious about stopping terrorism, the last thing it would do is use military force in an effort to eliminate Sunni extremist groups. To be fair to Powell, Zarqawi was in fact operating in Iraq. In anticipation of a US invasion, Zarqawi had traveled to Iraq to build a network that would be used to attack coalition forces after the invasion. In reality, Saddam's regime was not at all sympathetic to Sunni extremists. Saddam's government was based on the premise of secular Arab nationalism, something which had long been under threat from Islamic extremists. Most notably, following the 1979 assassination of Egyptian president--and icon of Arab nationalism--Anwar Sadat by Islamist radicals, Saddam had Sunni extremist groups operating in his own country mercilessly hunted down and destroyed. Iraq did finally become a home for al-Qaeda after the US invaded. Initially, much of the resistance to the occupation was nationalist in character, with figures like Shia cleric Ali al-Sistani spearheading relatively secular resistance. However, Iraq's neighbor Saudi Arabia, the global home of Sunni extremism and close US ally, soon began exerting its influence in Iraq. The Saudis began providing funding for groups like Zarqawi's, and took advantage of increasing Sunni anger over their loss of political power to the Shia and Kurds and discrimination in the already miserable labor market. Relying on Sunni networks within Iraq, by 2004 Saudis and other jihadists were flocking to the country for the opportunity to martyr themselves.3 Along with attacks against the occupation, Sunni extremists began launching attacks on working-class Shia. By 2005, slaughter against Shia had reached untenable levels, and Shia being meting out random retribution attacks against Sunnis. As Cockburn writes in 2005 from Baghdad, “There are near daily massacres of working-class Shia, but now the Shia have started to strike back. The bodies of Sunni are being found in rubbish dumps across Baghdad. 'I was told in Najaf by senior leaders that they have killed upwards of a thousand Sunni,' an Iraqi official says.”4 Death squads began openly roaming Sunni neighborhoods, with the newly installed Shia government's tacit support. In turn, the brutality of the retribution attacks drove even more Sunni into the ranks of the jihadists, creating a vicious cycle which sparked an all-out civil war by 2006. It was around this time that Zarqawi's organization, known as al-Qaeda in Iraq (AQI), reached its zenith of power. With the civil war raging, Sunnis soon began to view AQI as being their best hope for protection from Shia paramilitary groups. In turn, the ever ambitious Zarqawi announced the creation of an Islamic State in Iraq (IS). By the time Zarqawi had announced the creation of IS, he had become coalition forces' enemy #1. In reality, Zarqawi's announcement of IS was a last ditch effort to avoid being sidelined by bin Laden, who increasingly viewed Zarqawi as a disrespectful threat to his authority. Zarqawi should not have been overly concerned, as US efforts against IS succeeded in killing him and almost the entire leadership of IS in the summer of 2006. Although IS was down, they were not out and their rebirth would show once and for all how futile military action is when these organizations enjoy large levels of popular support. After the death of the IS leadership, a Quranic scholar by the name of Abu Bakr al-Baghdadi was appointed the leader of the new Islamic State. As the US lurches towards a war whose carnage may be not be limited to the Middle East, intellectuals like the ones at the Washington Post Editorial Board continue to offer their full support in the name of stopping terrorism. “The United States cannot prevent a resurgence of al-Qaeda and the Islamic State...without maintaining control over forces and territory inside [Syria].” It's hard to believe such educated people could be so stupid, it's almost as if there are other motivations at play. 1. Cockburn, Patrick. The Rise of Islamic State. New York: Verso Books, 2015. Print. 39. 2. Cockburn, Patrick. The Age of Jihad. New York: Verso Books, 2016. Print. 140. 3. Cook, Jonathan. Israel and the Clash of Civilizations. London: Pluto Press, 2008. Print. 146. According to one Iraqi who met George Bush just before the war, the president was intrigued to learn, apparently for the first time, that Iraq is inhabited by two sorts of Muslims, Sunni and Shia, with deep differences between them. Patrick Cockburn, The Rise of Islamic State. Of course, US military action will once again be taking place under the banner of combating “terrorism”. 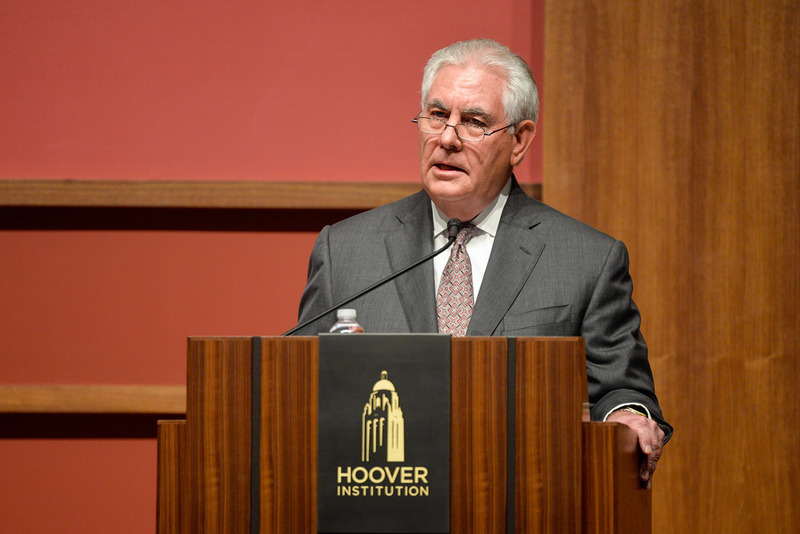 To begin the speech, Tillerson made the absurd claim, popular in neo-con circles but not supported by a shred of evidence, that Syria's Bashar al-Assad is backing ISIS and al-Qaeda in an effort to “destabilize his neighbors”. Aside from the fact that the Assad regime, in conjunction with Russia and Hezbollah, has fought bitterly against ISIS and al-Qaeda since 2012, the claim makes no sense given the sectarian nature of the conflict. Assad, along with much of the Syrian ruling class, comes from the Alawite sect of Shi'ism, a sect even more detested by Sunni extremists than Shias themselves. This to me seems to give too much credit to Assad for fighting ISIS and Al-Qaeda. Assad has carried out plenty of bombings of civilian populations since 2012. Russian and Assad propaganda has also relentlessly tried to paint any elements of the FSA as equivalent to Al Qaeda or ISIS, whereas things are really all over the place (my knowledge of the FSA is not great, but everything I've seen shows a massive amount of confusion, both due to conflictig narratives and actual contradictions and shifting allegiances on the ground). I don't think it's useful to downplay what Assad has done (which has been the line that the PSL/Answer, Counterpunch and other 'anti-imperialists' have taken) - US military intervention can be opposed regardless. Since 1970, Hafez al-Assad and his regime skilfully used religious and ethnic sects and sectarianism – in Syria as well as in Lebanon – to consolidate their rule, fuelling sectarian tensions but keeping them under sufficient control so as to justify the 'need' for this rule, otherwise “things would get out of control and the country would descend into a civil war,” as we were often warned. The term 'politics of sectarian tension' can probably describe this policy better than the cliché 'divide and rule'. To give you just a glimpse, Hafez al-Assad – and his son Bashar after him – always prayed in Sunni mosques, appeased Alawite religious and community leaders, while at the same time marketing itself as a 'secular' regime. I welcome Soapy's text; it raises some interesting questions some of which I'd like to comment on. I don't think that one should be at all surprised that "intellectuals" of various kinds, senior journalists and the like are once again supporting the nation state and its war efforts. We saw it with the Gulf War of 91, we saw it with the 2003 war against Iraq based on the fake news that papers like the Guardian and Observer propagated against overwhelming working class cynicism and we see it in spades in all the "anti-fascist" wars of last century, particularly World War II. And we saw how the intellectual elements of the bourgeoisie fell at the feet of the "divine" butcher of the Rohingya, Aung San Suu Kyi, as the west tried to use this grotesque product of MI6 in order to confront the expansion of Chinese imperialism. When it comes to pursuing warfare in the interests of the nation state then capitalism's journalistic pimps of both the left and the right not only tend to toe the line but are often the most rabid defenders of their killing machines (I would make an exception of Patrick Cockburn and one or two others) and this is particularly true of the left wing elements. Soapy, above, talks about a "clear" US policy in regards to its move towards war in Syria which, as he says, has certainly got more support across the political spectrum. But I think that just a glance at the general situation of the Middle East, from which Syria can't be disengaged, shows that rather than clarity of purpose (even if based on outright lies) from the US is non-existent. On the contrary, I would argue that US influence in the Middle East generally is in decline and disarray. This is not "good news" in general but is indicative of the irrationality and centrifugal tendencies that are overwhelming this region (and beyond) inflicted upon it by imperialism. The Trump alliance with Saudi prince Mohammed bin Salman has directly come up against US military interests in Qatar. The stupid recognition of Jerusalem as Israel's capital has inflamed the situation further and - as Patrick Cockburn has pointed out in the past - bin Laden's greatest recruiting aid, forgotten somewhat after 9/11, was the miserable situation of the Palestinians. Just as the "war on drugs" produces more gangsters and states producing illicit drugs, so the "war on terror" has always produced terrorists. Although bin Salman said that he would like to get out of it, there's no indication that the US is going to let up in the war in Yemen. It's interesting here that US Special Forces (SOCOM) would rather work with the Houtis than the Saudi-backed factions that have close links to AQAP - and, moreover, being well-paid for it by the US courtesy of the "war on terror". And if the role of Iran was greatly exaggerated in Yemen - no less down to the US mainstream press toeing the anti-Iranian line of both Republicans and Democrats - then they are involved now and expanding across the Middle East as the US grip weakens. And all the time the misery of the masses in Yemen grows as the war turns into a multi-fronted free-for-all of various state-backed factions, warlords and gangsters. Saudi, with the "finest mercaneries that money can buy", the best US weapons, "logistical support" from America and Britain and a coalition of partners has been unable to defeat what is basically a motely army of Houti regulars. The US is going to fight a war in Syria - how? The fighting going on now in Syria is by a US and UK-backed faction of Kurdish nationalism (send donations and contributions for Rojava straight to the Ministry of Defence, Whitehall and cut out the middle-man) and a Nato ally Turkey who are both armed with US weapons. As Soapy says there's no way that Turkey will accept what the US first called a "border force" of Kurdish dominated forces in a sort of proto-border state. This again is a complicated multi-sided war where certain Iranian and Syrian interests are linked to the Kurds but the major flashpoint here is between Turkey and the US with the former showing a tendeny to move towards Russia. This would be a further blow to the US and, while it is not a simple pawn of Russia, further increase Iranian influence which is the number one US target at the moment. Soapy is right about the war spreading - it already is, to the east and Horn of Africa. Turkey, Iran, Saudi and the UAE are all building up forces and influences here as are Israel, France, Britain and the US. We can see the war in the Middle East spreading in front of our eyes and from both Africa and the Middle East (without mentioning Afghanistan) refugees will flee to what they see as the relative safety of Europe.